One thing I remember as a child , was my advent calendar. I couldn't wait to start this tradition with my son, so two years ago I bought him a lego advent calendar. This year I altered a Starbucks advent calendar with the new Love Elsie Noel collection and put each lego set in the drawers........I cannot wait for him to wake up and see it tomorrow. FYI Starbucks has these advent calendars on sale for $10. 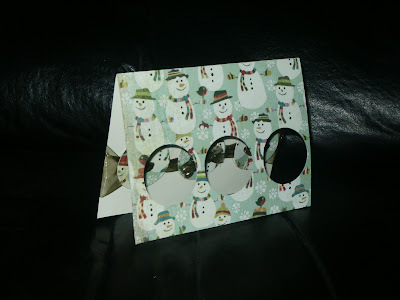 I was feeling a little crafty the other day and made this to put my son's picture with Santa in. 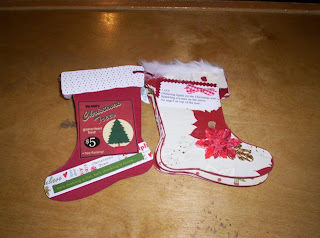 I used the new Carolee Creations Christmas collection and altered Creative Imaginations large clothes pin. I also used KI Memories new die cut paper, its great to tie ribbon through the holes. 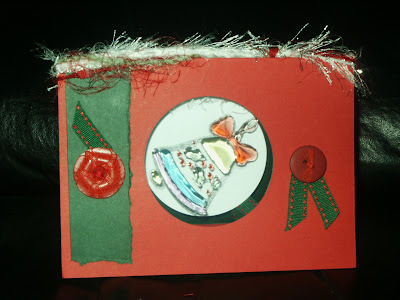 Then I embossed with Autumn Leaves Rhonna Farrer's Christmas Swirl stamps. 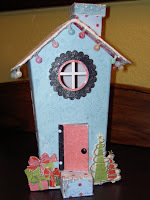 I got this idea from the new idea book by Carolee's Creations. I used big cardboard letters instead of the wooden ones in the book - but I love how it turned out. 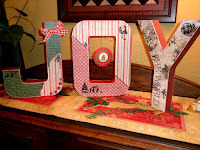 I used mostly Carolee's Creations paper, but I supplemented with some other that I had on hand. 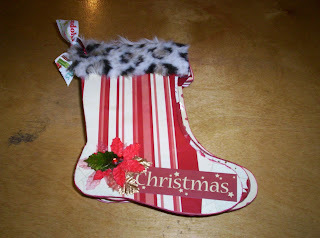 Some rub ons, ribbon and a little ornament and it was done. 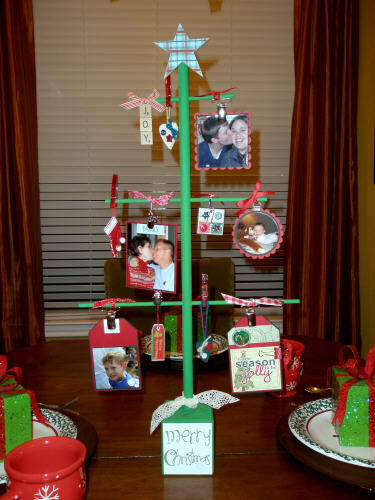 Then I saw this tree that Carolyn was working on and I knew I had to make one for my table this year. My tablescape is very whimsical - all bright green and red - and I knew it would be perfect. It is also made by Carolee's Creations. I think I started out making it JUST like the one in the book...but once I painted it green....I just made it with what I had on hand. What I love about this project is that mine doesn't look like Carolyn's and the next person's wouldn't look like mine. Finally, I wanted to show you these ornaments. I saw them on a blog today and wanted to try them. I SO wish I had a collection of double sided papers - but they still turned out ok with what I had in my stash. BUT I AM going to get a few double sided papers all from one collection and make some more and hang them at the Inn in the croproom. Yea! Another trip to the Crafty Scrapper for paper. Thought we should put a note on here about extended hours during the holidays: We will be open from now until Christmas on Sundays from 1:00 to 5:00-ish. Don't forget that on Friday nights we are here until Midnight. Send your husbands or come on in and shop with us. There are several gift items displayed to give to the scrapper or to be made by the scrapper!! We wanted to share our tree this year that was donated to the "Festival of Trees". This is our 3rd year donating a tree, I love seeing all the different decorated trees that are donated by various business and organizations throughout the Waxahachie community and are auctioned off with the proceeds benefiting the Education Foundation. THESE ADORABLE BIRD ORNAMENTS WILL BE OUR NEXT "HAPPY HOUR PROJECT"
I wanted to share the two projects I worked on for the Design Team. First is a cool wood frame that I painted and altered, perfect for a family gift. I used the Cosmo Cricket holiday line. But my favorite touch was the Making Memories gold glaze. The other project is a teacher gift, I used one of the new Maya Roads clear albums and the Junkits school line. I love doing teacher gifts using pictures from the kids Fall Party. I also used the new KI lace paper, this is the coolest stuff ever. Lots of ideas for this one little book. 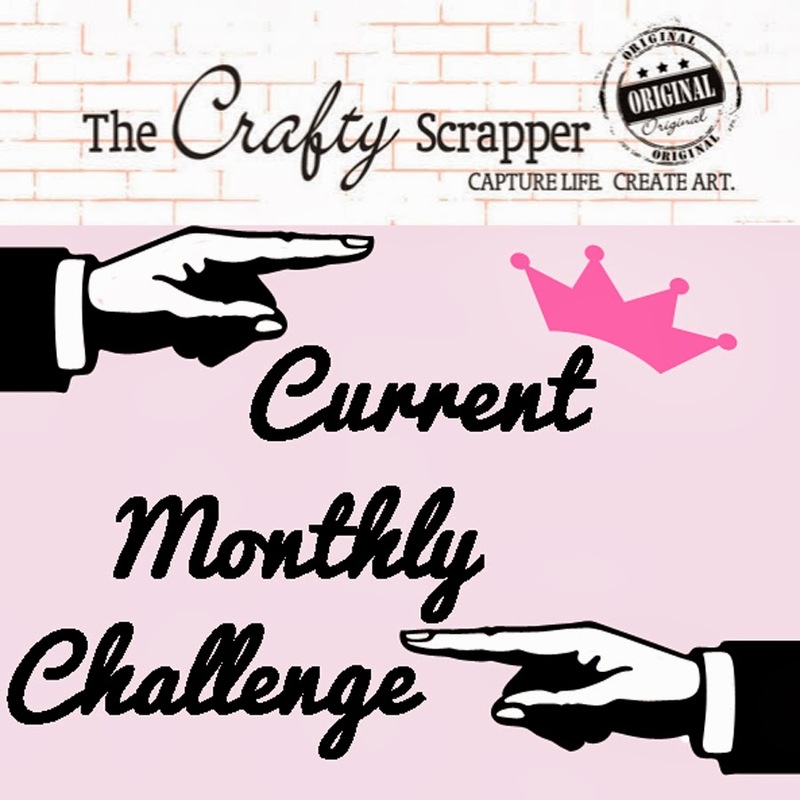 Perhaps one of the ideas used in here will spur you on to create something of your own. This little book would be great as individual stocking ornaments, a great garland of stockings, or as a little book of memories. I tried to use several types of papers and styles to give multiple ideas. Check it out at the store. Link your projects with this book to the post here.....or email them to the store. Thought I'd share with you what I did with this neat Prima Book. The front cover is embossed and then the pages & back cover are flat. I used some paints on the front along with some chalk ink to get the texture to stand out. 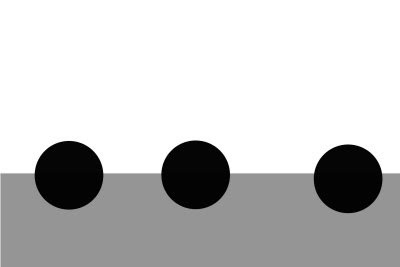 A piece of old music with a Daisy D rub on is in the center. 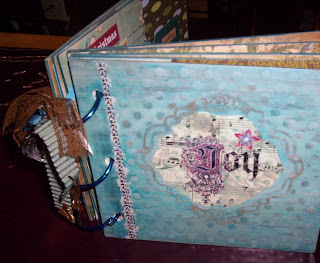 I went ahead and covered the whole thing with ModPodge just to seal the paper better. There are several styles of embossing on these cute books at the store. 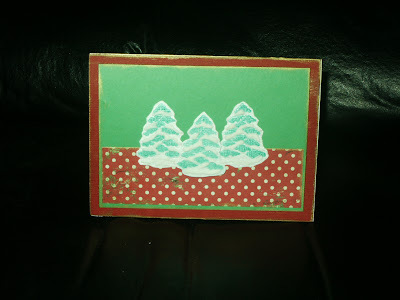 It measures about 6 x 6 inches. I went ahead and used notebook rings with ribbons to hold the book together. There are several other ways to do this as well. 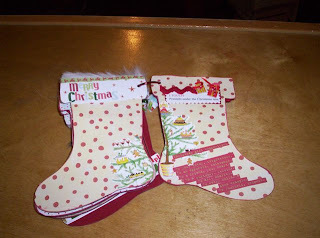 Even though this is not your typical Christmas paper, I made the book about Christmas. I used the song "Christmas Is..." for the wording. A couple of other quotes are on pages too. I have seen so many neat books by others with a song or a quote as the wording. The paper is a mixture of papers, but mainly is K and Co. Safflower Line of paper. I also had fun spraying Glimmer Mist on some of the pages to keep the white paper from standing out too much. Be sure to check it out. Annette had made some tags using this with different techniques, which I need to try, but it was fun just to tint paper too. For embellishments I used a lot of different things...old stuff I had collected, Creative Cafe tags, Daisy D rub ons and stickers. 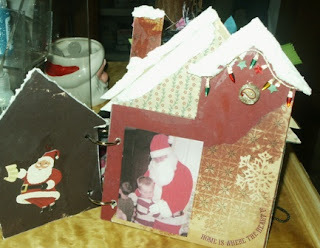 Although there are embellishments on the pages, it could still hold some favorite pictures. Of course, it is at the store to touch and look at in person. Would love to see what you do with the book. Link you pictures in the comments if you do one of them! And the winner is.......................Debbie Jones! One of our locate real estate agents with Keller Williams wanted to do a drawing in our store. The winner won this AMM tote filled with goodies. Do you think Debbie was excited? 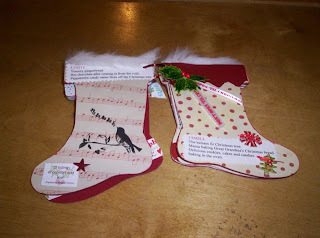 Well, I have been busy - like Santa - creating some fun projects for the store. 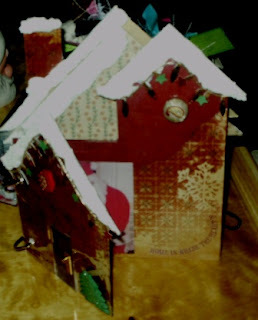 First of all, I made this chipboard house. I really did enjoy it....until I got to the steps. 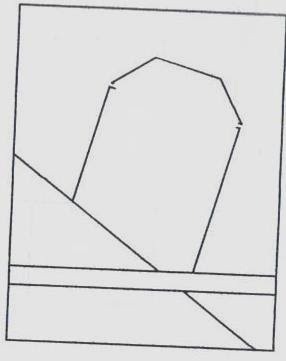 Well, I guess I should have looked at the picture before I wadded the steps up and threw them away.........the directions stumped. But once I saw the picture and looked at the directions, I sooo could have done it. But alas, the steps were a bit too worn by the time I unwadded them. So I made my own step for the front of the house. Hope the other chipboard houses in the neighborhood will be OK with my makeshift steps. You know how zoning laws are ! Oh well, there goes the chipboard neighborhood. 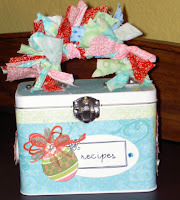 My next project was this great little recipe tin. I think I see a theme starting - cool cool Christmas colors. It is such a simple project...but I loved making it and I love how it turned out. Probably took me all of an hour to make. I haven't filled it up with recipes...I think I would rather scrapbook than cook. 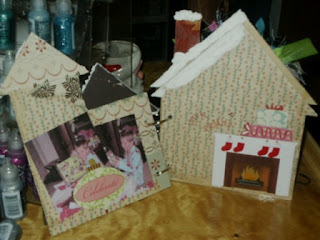 No wait...I KNOW I would rather scrapbook than cook. 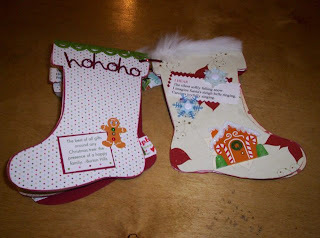 Next I worked on this adorable envelope and tag mini book. 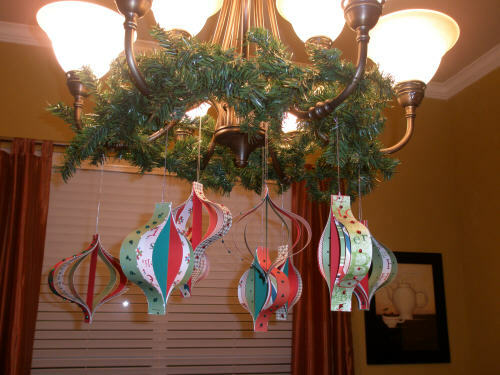 I started out making one JUST like one in the Carolee's Creations book, but within five minutes, I had paper flying and a whole new take on it. So I love mine...and I love the one in the book too. I think you could do so much with this concept. I can't wait to make another one. Be sure to come by the store and see ALL of the great projects and the wonderful new papers and embellishments. I made some ornaments too - so be sure to come by and see them.